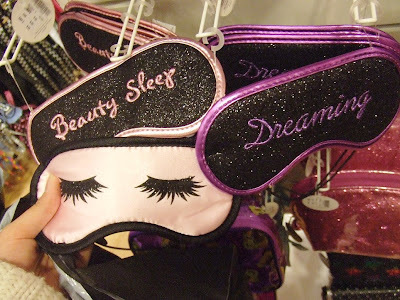 Shazwani Hamid's Blog: All the pretty little things..
Like for example, sleeping mask. I have tons of them in my room! 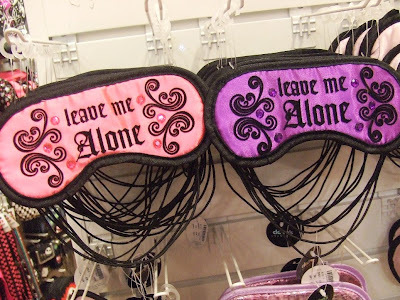 You name it, I have all types of sleeping mask! Gel types, bean type, silk, cotton, cashmere, satin types.. haih.. sometimes when I look at them I just wonder why I bought all these things.. hmm..
Anyways.. Just wanna share the cute stuff that I bought last month..
Eh, kat mana u beli satin mask tu? Dok cari tak jumpa la.Last time check kat La Senza ada lace bagai so i tak suka. where did you get the sleeping mask? So what type is the best in your opinion? (u can find the stores in amsterdam/UK/paris/japan,etc)..
anonymous: i think it would be the satin type and cashmere for normal use..as they really felt soft on the eyes..
a'ah la sama cam privilege punye~! kt mane u bli air freshner bags tu..